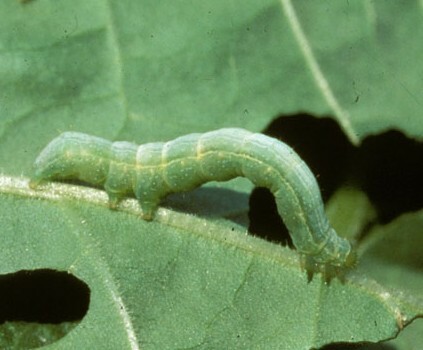 There are two caterpillars that attack cabbage and its relatives (e.g., broccoli, cauliflower, kale, etc.) 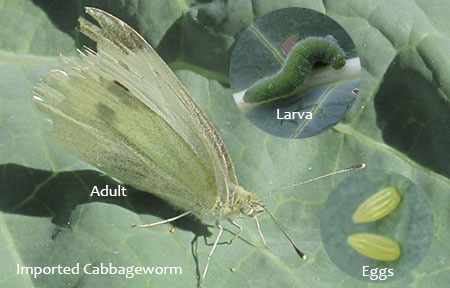 in east Idaho – the imported cabbageworm and the cabbage looper. The imported cabbageworm is by far the most common. The adult is a white butterfly that can be seen flitting through the garden as it searches for host plants to lay eggs. The immature stage, or caterpillar, is lime green with short fuzzy hairs on its body. The cabbage looper adult is a brown moth and the caterpillar is light green with white stripes down its body. Its “looping” crawl causes its back to arch as it pulls its hind end forward like an inchworm. The cabbage looper is seen less frequently in our area. The caterpillars chew ragged holes in the leaves and contaminate the harvested product with their frass (excrement) and bodies. To protect plants from egg-laying, cover them with floating row cover, or remove caterpillars by hand or with a stiff spray of water from the hose or overhead sprinklers. Organic insecticides effective against young caterpillars include Bacillus thuringiensis (Dipel dust), and spinosad (Fertilome Borer, Bagworm, Tent Caterpillar, and Leaf Miner Spray). Carbaryl is a non-organic chemical available as a spray or dust.